So yesterday we finally figured out our lake lot pump we'll be using for the feed to the camper, the outdoor shower, and the sprinkler system (yes our rent-a-lot at the lake will be nicer than our regular house). I owe a big thanks to my cousin Bryant and some other guys at the lake (Walt, Jim, Jeff, and my dad) for helping out. Having never set up a well pump turned into a daunting project for one person. Thanks for the help guys. Now our grass seed will have plenty of water. In other news, I decided to sell our free camper that we got at the start of the year. I had fixed it up a bit, gutted the rear bathroom, replaced the floor, put carpet tiles in, and used it for a couple of months this summer. Total invested was about $100. Put it on Craigslist last Friday night, and sold it today (Monday) for $900. Gotta love that! I'm glad to see the old pig gone, but it served it's purpose for use for a little while. God was good to us for providing that and then allowing it to sell so quickly when we wanted to get rid of it. Another cool thing is this bike. 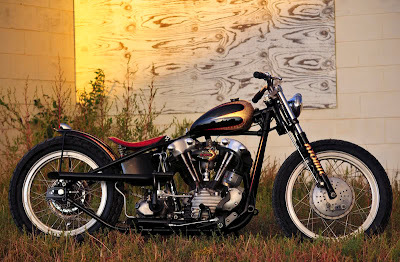 It's a Harley Knucklehead and I don't know who it belongs too, but it's the nicest looking Knuckle I've ever seen. Just thought I'd share the artful beauty.